Love is always the answer. No matter what. Whatever you’re doing, if it doesn’t feel good, it’s not working. Love is available to access in every single moment. I can remember a time during childhood (well, it lasted a long while) when my mom would say to me after some silly choice, bad decision or rude interaction, “What happened to sweet little Stacy?” I heard this for a long time whenever I kind of got out of line or needed some parenting I suppose. In the beginning this question really upset me and made me feel like I wasn’t a nice person. Over time it haunted me even more and I began to ponder it myself. Had I quit being sweet? Was I a bad person? During adolescence I distinctly remember her asking this question again and I had this fury inside where I screamed, “She NEVER existed, all I have ever heard is ‘where is she?’, she was never here, it’s just me, quit asking.” (I don’t think I had the courage to say it aloud to her, I think I imagined I did, but didn’t…I probably played that scene in my head over and over, I’m really not sure if I ever discussed it with her). First, let me say, my daughter is amazing. She is so many wonderful things…too many to list here. Because I am her mom, I also see another side to her. The mom gets to see it all. I can see she is growing and changing. Because of all the reading about spiritual things I do, I can see that the ego is trying to take hold and her identity is changing. I can see when it happens and I am also painfully aware that I am the one she is most comfortable lashing out at. She is so kind in her heart…its just me she will melt down with and show another side to, growing up is tough. I have heard myself say to her so many times, “you would never treat anyone else that way, only me.” Sounds a lot like the question my own mother had of me. I am sure I have said even worse to her in tough moments (forgive me sweet girl). This parenting stuff is not easy. When I can lean back and look at things I can see what is happening and not take it personally. Other times, it hurts so bad. It’s tough to juggle knowing if we’re parenting or judging. I have been thinking about this recently and trying to watch it with her. I don’t want to judge her or make her into me. I want to help her be the best version of herself. I want to honor her growing and help her learn to make good choices. If she feels judged by me, she won’t be able to feel my love, she will turn towards her fear instead. Oh, how I want to be the mother that doesn’t judge. I am so trying to figure out how to parent well without judging. Recently, she lashed out at me because she was struggling learning something. Often, when something seems hard, her fear brings out the worst. Understandable. Anyway, like I said, I struggle with allowing her to be herself and still guide her towards making good choices. After appealing to her with explanations of kindness, etc., she just kept pushing, I allowed her actions to hit my buttons and I decided she needed a break and told her she would be in timeout. In fact, I gave her a double timeout. This would mean 16 minutes to think about her actions. As she stormed down the stairs in anger, I had a change of heart. I sent her brother to tell her that mom had changed her mind, this gave me a minute to breathe and pause and choose well (that non-reactionary living I am striving for). When she returned to me, I said to her, “You get to choose who you want to be.” That was all I said, she returned to her work. Within a few minutes, she came to me and gave me a sweet kiss and hug and apologized. She had found her “sweet” and turned towards love. I knew she could do it! We talk to the kids so much about character and our choices. We explain that your choices make who you are. We have so many ways of explaining it to the best of our ability. I also believe that people treat you how you let them treat you and I don’t want to raise kids that are rude and disrespectful to their mother. Not just for me, but I know they won’t feel good about themselves if they choose that. Allowing my sweet daughter the space to find who she wants to be on her own with just the right amount of guidance and a big dash of modeling my own good choices seems to be the recipe. For now. I am going to continue pondering parenting without judging. I think it’s worth the effort to try. As I embrace the freedom from being right or wrong, I do want to impart some of this concept to the kids. It is tough because they so badly want to be right…all the time. I told them recently that I really don’t want to parent every single little thing and be right and make them wrong…but what I do want to do is parent for peace. I explained that even when they are corrected or get in trouble, they really haven’t done anything wrong, but we must try to work towards creating more peace and harmony. If we’re behaving in a way that creates more peace and harmony, then there won’t be much chance of getting into trouble. As we discussed this more and exactly what harmony means…we were turned to look outside at nature and observe the perfect harmony all around us. I love how the answers are always there in the perfection of nature. Mom – THANK YOU so much for guiding me towards finding “Sweet Little Stacy” – slowly over time I am finding her in the essence of my true nature. What a gift it is to know she does exist and she is there in the purest form in me just as she is in everyone else. Wishing you all a quiet moments with the Sweet Little One inside you. Joy! It is a shame how familiar we become with so much of our lives. It would seem that we would find comfort in the familiar…that is not the case. We completely check out and become numb to what is happening around us. We can’t see the people or places around us that have become too familiar, we see it all through a veil of our past observations, images and experiences. With the MOST familiar people and places in our lives it can do the most damage. We can be completely missing what is right in front of us…the very thing we love the most, we sometimes give our attention to the least. Learning about this concept from John O’Donohue in Anam Cara, A Book of Celtic Wisdom was a gift in my life. The gift of seeing the unfamiliar in the most familiar things can wake us up to life. Life takes on a whole new energy when you can really do this. I have had experiences where I felt as if I snapped into attention and really saw my child’s face for the first time in too long. Children’s ability to notice this right away is really something to behold. I cherish those moments when I was really looking at them with unfamiliar eyes. I have also been thrilled to look at my husband and see him as if we were just getting to know each other; it’s so fun to experience the excitement of the early dating days…it just takes a little shift in attention. It takes practice to dwell in this for any length of time, but it is so worth trying to improve at it…life changing when we can do it. Seeing the unfamiliar in the most familiar things doesn’t mean trying something new to wake you up. It is quite the opposite. It means really watching where you put your attention and what conditioned responses are running in your head. It takes watching your thoughts and not identifying with them. It takes letting those thoughts pass by so that you can create new and fresh ones that are found in the unfamiliar or the fresh moment. The truth is that no one is ever exactly the same as the last time you met them. I know for sure I am not. Sometimes I could just cringe at running into someone I knew well ten years or so ago…I think, oh my gosh they know me from two lifetimes ago… Even when we see people once a week, they are never the exact same person they were the last time you saw them. Allow this freshness to be there and try to see them fresh in the moment. With our MOST familiar people and places it takes the most heightened focus, but what it can do for those relationships and experiences is miraculous. Seeing only the familiar takes all the excitement out of life. Dare to see those closest and most familiar to you in new and unfamiliar ways. I realized with my own children recently that I am the MOST familiar thing in their lives. I am the thing they have been the most familiar with for the entirety of their lives. I used to wonder why they would say and do things to me that they would never dream of doing to someone else. I struggled with why they save their exquisite manners and politeness for everyone else. It finally dawned on me that I am the MOST familiar thing to them and they are also the MOST familiar thing to me. We could spend our entire day responding to our ideas and images of each other rather than actually seeing and experiencing each other fresh in the unfamiliar. I want to really stop and listen to them and see the new expressions that cross their faces and the new things they are excited about. Just because I am so very familiar with them and so involved in everything they do doesn’t mean I am really seeing the unfamiliar and allowing myself to look at them with fresh eyes to spot new changes and truly hear what is important to them. It is something I have to practice, especially if I want them to do that for me. It is a terrible feeling as a mom to feel like you repeat yourself a million times and no one is listening. Argh. I think I have stumbled into a great truth. If I want them to look at me with fresh eyes and see me, then I must do that for them. This is true for the MOST familiar people and places as well as everyone and everything else too. Wishing you the profound joy and fresh aliveness that comes with experiencing the unfamiliar in the MOST familiar things. Below is one of my favorite passages from Anam Cara, A Book of Celtic Wisdom, by John O’Donohue. What a gift! Behind the facade of our normal lives eternal destiny is shaping our days and our ways. The awakening of the human spirit is a homecoming. Yet ironically our sense of familiarity often militates against our homecoming. When we are familiar with something, we lose the energy, edge, and excitement of it. Hegel said, “Das Bekannte uberhaupt ist darum, weil es bekannt ist, nicht erkannt”– that is, “Generally, the familiar, precisely because it is familiar, is not known.” This is a powerful sentence. Behind the facade of the familiar, strange things await us. This is true of our homes, the place where we live, and, indeed, of those with whom we live. Friendships and relationships suffer immense numbing through the mechanism of familiarization. We reduce the wildness and mystery of person and landscape to the external, familiar image. Yet the familiar is merely a facade. Familiarity enables us to tame, control, and ultimately forget the mystery. We make our peace with the surface as image and we stay away from the Otherness and fecund turbulence of the unknown that it masks. Familiarity is one of the most subtle and pervasive forms of human alienation. The Universe (God, Life, Love, All, Everything…) went to a lot of trouble to create this exact moment that you are experiencing. It has been arranging millions of things and designing perfection for you. It has then invited you to come. That is the case in every moment. Always. Each moment is perfectly created for exactly the right circumstances for you and the evolution of your soul. All we need to do is simply be there in the moment fully to experience the perfection we are meant to have. Unfortunately, we often skip the moment entirely by bringing past issues or experiences and future worries or stress with us in our minds that keeps us preoccupied and unable to BE where we are at fully. The moment that the Universe worked so hard for us to have is completely lost on us, we just can’t feel it. We are more blessed and loved than we can imagine because the Universe (God) loves us so much that at the very moment we miss yet another of its precious gifts it had picked out for us, it is already working hard to create another one to invite us to that is just as perfect. It lines up infinite details to create divine experiences for us and no matter how many moments we miss, it continues to invite us to the next one. Continuous understanding, compassion and invitations. Amazing! Imagine if a loved one had decided to throw you a special party…they organized every last detail to make it the best celebration of your lifetime and you just didn’t show up. You just never went. When we live with constant distractions, mind chatter and stress, we just aren’t showing up at the party the Universe has planned for us. Lucky for us, the Universe will go on planning, arranging and coordinating the perfect experience for us…but, our soul longs to skip the detours and delays. It will all work out just as it should, but perhaps by understanding what we are missing we can truly focus on figuring out how we can show up at the party now. Let’s do everything we can to go to the party the Universe has planned for us…the joy. Wishing you joy today and always! I know you can get to the party and feel the joy; my faith in you helps me feel I can dwell in the joy more often myself. Let’s Live It! We have people to meet, things to see, stories to hear, love to create, adventures to encounter…the joy is always waiting for us. Perception is a wonderful lesson for children of all ages. It is so helpful to teach them to step back and consider different points of view. We want to raise kind compassionate children and teaching them the skill of looking from various perspectives is a great way to start. My daughter and I first began talking more deeply (past simple sharing) about perception in preschool when she was dealing with what seemed to her like a mean little girl. We discussed the other possible options or reasons why it may seem like she is being “mean” and tried embrace other scenarios, etc. We tried to put ourselves in her shoes and see things from her eyes. It helped. In the end, they became friends. These conversations continued throughout the years. It also helped me teach her to try not to take things personally and to always look for the good in others because it is always there. Perception can open up so many things in life and you can take the lessons as far as you are willing to open up your mind. You can start with simply seeing things from another view-point and take it all the way to the ultimate illusions in life that we all experience. Ultimately, perception can lead you to constant peace. For children, just introducing and discussing the concept can free them from a lot of heartache that would stem from judging others and insisting they are right, etc. Some of these concepts may go over their head at first, but not for long. I figure it’s like songs written in consciousness, at first they just seem like catchy tunes and then as you change over time you hear the profound wisdom within and it’s like being hit over the head (I remember singing Imagine along with the radio one day and finally hearing the words I had memorized long before, I had to pull my car over I was so awestruck and thrilled to finally understand what was being said). I figure someday they will have a moment where it clicks and they will say, “Wow, that is what my parents were talking about.” Sometimes they surprise me and say something so profound I am sure they remember where they came from. I often wish I was as present as my son, so I am sure we are learning from each other. My daughter and I have continued these conversations about perception over the years to help her embrace her compassion and willingness to see things from various points of view. We are a homeschooling family so we can spend a lot of time on subjects that interest us, it’s just one of the many perks. We have a lovely assignment we would like to share. 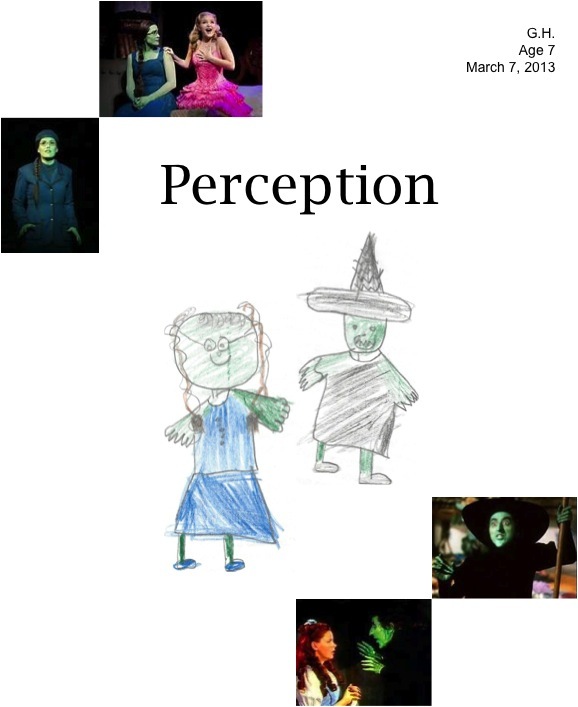 This year we saw Wicked at the theatre and knew immediately we could make a great perception assignment out of it. My daughter already knew Wizard of Oz very well, she had seen the movie several times and played Oz in her children’s theatre production. Once we saw Wicked, it opened up an entirely different viewpoint of the story. We loved it and we spent a lot of time on her related essay about perception. Her essay is below. She was seven years old when she wrote it. We spent a lot of time having editing meetings and getting to this final draft. Another home school perk we enjoy is learning through editing and editing until we get to her personal best version. From a seven-year old point of view, it is just precious. It is a great lesson for us all. Please enjoy the essay below on perception from my kind and compassionate daughter. I had to include this adorable title sheet she created. People see situations in different ways. Perception means how you see things. This paper is all about how you look at things. The Wizard of Oz and Wicked are great examples of ways we can perceive things differently. My fright of the Wicked Witch of the West in Wizard of Oz was equally matched by my love for her in Wicked. The Wicked Witch in the Wizard of Oz was so scary. The Munchkins were terrified of her. They were so scared that every time the Wicked Witch came they would hide from her. She always had this funny and terrifying laugh. Whenever she saw Dorothy she would say, “I’ll get you my pretty,” and then laugh afterwards. The Wicked Witch wanted to kill Dorothy and her friends Scarecrow, Lion and Tin Man. She really wanted the ruby slippers badly and she would do anything to get them. She was completely terrifying and I felt so relieved when Dorothy melted her! In Wicked, the Wicked Witch of the West was loveable! Her name was really Elphaba. She was born green and everyone was mean to her. She was smart. She took good care of her crippled sister Nessa. She wanted to help the animals. She tried to do good things but they did not go well for her. She was totally tricked by the Wizard of Oz and everyone thought she was bad even though she was good. She just wanted those ruby slippers to remember her sister. In the Wizard of Oz I was so scared of the Wicked Witch of the West but in Wicked I loved her. In the Wizard of Oz the story was told from Dorothy’s perception, it made you see things how she did. In Wicked, the story was told from Elphaba’s perception, throughout the whole show you see her side of the story. The way these stories were told from the perception of different characters made it possible to equally fear the Wicked Witch in one story and love her in the other. My fright of the Wicked Witch of the west in Wizard of Oz was equally matched by my love for her in Wicked. In both shows there was a different way of looking at things. This is what perception is all about. In all things in life people have a different perceptions of things. This explains why people make different choices. Understanding people’s perceptions can lead us to kindness and compassion. I want to always remember that people have different perceptions because kindness and compassion are the most important thing in life! This isn’t what I thought I would post today. I have been working on something else entirely. But, yesterday I wasn’t exactly living what I know…it was more like forgetting what I know. Then as I was writing that other post, a third option occurred to me…writing about what you know. I don’t want to just write about what I know here…I really want to live it and I know that is what the universe wants for me…it is the same impulse. I couldn’t post something that wasn’t truly in the energy I am in. The other post will have to wait until I am ready to live it more fully. That time will come soon enough. The blessing is that the words don’t really come unless you’re vibrating in that space (meaning, it’s not well written at all yet). I am grateful for that…it is a wonderful practice. Yesterday, my personal best wasn’t so great. I was losing my patience, taking things personally, basically just living in a state of reaction instead of presence. All these little choices turned into a not so great day. I allowed all those choices to happen and created suffering for myself and for those around me. Basically, I let fear take over and thoroughly take me off track. I kind of stayed in the mode of feeling down and upset with myself for not choosing to live all that I know. I felt exhausted, scared and sad. I didn’t really resist it, it just took over and I let it. I smiled. My heart let out a little sigh of relief and I began to heal. I didn’t really rush myself, I just turned towards love as I decided to love myself through my failure. I know that being hard on myself will help nothing (I have done that enough). I knew that the next day wouldn’t be like this one and I would learn from it. There was a lot of learning going on throughout the day. Our failures can show us so much if we are willing to look directly at them. As I nurtured my soul a bit and allowed myself to do whatever comforted me, I realized how lovely it feels to dwell in a place where you really do know that All IS WELL. Even if you have let illusions of fear creep in, they will pass. You can really feel that all is well even as you feel like you failed because all is well and it all happens just as it should. This morning, I feel rejuvenated and ready to choose from stillness again. I chose the unfamiliar this morning as the kids and I ate breakfast outside and enjoyed all the sights and sounds of nature. We all experienced a fresh new look at the day and a renewed energy towards really living what we know. So, was it really failure after all if it takes you to a morning of watching your kids and yourself delight in dragonflies and hummingbirds? If it was failure, then perhaps a new way of looking at failure is in order. Whether your failure is big or small…love yourself through it. It is there to show you something. Be kind to yourself in success and failure, for all that really matters is love. Perhaps the best practice today would simply be to listen with the fullest possible intensity and attention to everyone and everything around me. Maybe this simple act would ground me so deeply in the amazing flow of life and the perfection the universe has picked out for me that I wouldn’t hear any mind chatter and I could stay perfectly in the actual moment that I have been invited to dwell in. Maybe by really hearing what is being said and what isn’t being said in the silence in between and the stillness that surrounds me, I would feel only joy and spread pure joy to others. Maybe when you master listening, you master Living! I can’t imagine being able to answer the question above the way Hafiz did. Amazing! I can imagine how it feels to have a conversation like this or even one moment where you really touched the essence of life and heard what the universe is saying. I have experienced this kind of listening and it is absolutely breathtaking. Knowing this and experiencing this divine feeling, I still fall back regularly into the rush and let day-to-day life keep me from living with this level of attention. I think that once we know how important truly listening to life is, living in any other way is exhausting for our spirit and soul. I have a hunch that a deeper practice of listening to life with my fullest attention is just what my soul needs most. The joy of really hearing someone and really seeing them fresh in the moment feels so good to us and to them, it heightens the energy level of everything and allows us to be much more of ourselves. Truly hearing and experiencing the sounds around us with wonder can only bring more peace. Listening to the stillness behind everything is nurturing for our soul. I am ready to nurture my soul and replenish through listening to the best of my ability. I think we’re all starved for fuller attention from others and for opportunities to give our fullest attention to others. I believe truly listening is the most amazing gift we can give or receive. We can help someone hear what their soul really wants to say, just by purely listening. I would like to practice living in a way that honors all that listening really is. I don’t want to show up with my veil of perceptions, distractions and reactions, I want to be there fully and listen with my whole heart. I believe if done well, listening can change the way we see and experience the world. Once you start the journey of quieting the mind and opening the heart, it’s a shame to give the silence away and fill it up with your own words and your own distractions and reactions so easily! Surrendering our attention so readily to so many things without placing it purely on what is right in front of us now is like numbing ourselves to life where we can no longer truly experience anything. It is surrendering the beauty and joy that life has to offer. Our attention is sacred and must be cared for and treated with reverence. I don’t need to hear more of my little thoughts or my voice reacting to things, I want to listen to what life really has to say and truly live from there. Simply put – listening really really well to all of life could save us all a lot of trouble and bring us all a lot of joy. God help me listen, speak, breathe and be from stillness today and always! I wish you a day filled with generous listening — others to you and you to Everything! I also wish you love, smiles, laughter and fun! Beauty. What is it? Where does it come from? Why does it touch us so? What happens to us when we experience it? When we experience true beauty, everything stops. We take it in. We experience the stillness that it came from. I believe that we remember where it came from and it feels like home to us. It awakens us from our daily life for a moment and takes us somewhere else. It moves us. It thrills us. It is love sent to remind us of who and what we are. When we experience a beautiful song, a masterful dance performance, a great poem, a theatrical production, a scene in a movie, a sunset, a beautiful piece of artwork, even an amazing sports moment…anything that has true beauty, we are changed in that moment. Beauty can wake us up to more of life, it takes us out of the ordinary and out of our thinking mind — into our senses fully and it is a gift when it does. We stop thinking, we have no worries, we aren’t planning or distracted or bored…we are really there experiencing the beauty and relief in being taken to a more meaningful moment. We all have experienced those precious moments when we sit in awe of something so beautiful, we feel it deep inside. Remember it and you can feel it now. That moment is always there for us. We must remember that stillness and invite it to visit more often. We can bring more beauty into out lives, we simply need to be open to seeing it. We need to add enough space to let it in. Beauty is all around us. It is everywhere, not just in the so-called works of art. There is magical beauty in the smallest of things everywhere. Everything was created in that stillness. The truest of beauty is in the lines on an elderly face, the wag of a dog’s tail, the way the sunlight hits the sink full of dirty dishes, laughter, smiles, eyes, the book in your hands, the sound of your child calling “Mom”, kindness in any form, the mess you made having fun…beauty is everywhere. We don’t have to wait for the sensational, we can see it everywhere. We can let it wake us up to more of Life. Today, in many ways, beauty has been reduced to idealized notions of what society deems beautiful. It is actually rather frightening to see what is happening in the name of beauty. That is not what we are talking about here. We are talking about true works of Life. God is experiencing himself in so many ways and through that experiencing, comes beauty. We can bless our lives by looking with fresh eyes that are open to the beauty that surrounds us all the time. We can help others see the beauty too. Let’s take the time to touch beauty in a more meaningful way today and see how it changes our experience of life. Let’s not wait for the big obvious moments, lets find it in the imperfection that is called Life. Have fun seeing the beauty around you today, your soul knows how…today is the perfect day to spend more time with your soul. Your soul is pure beauty! 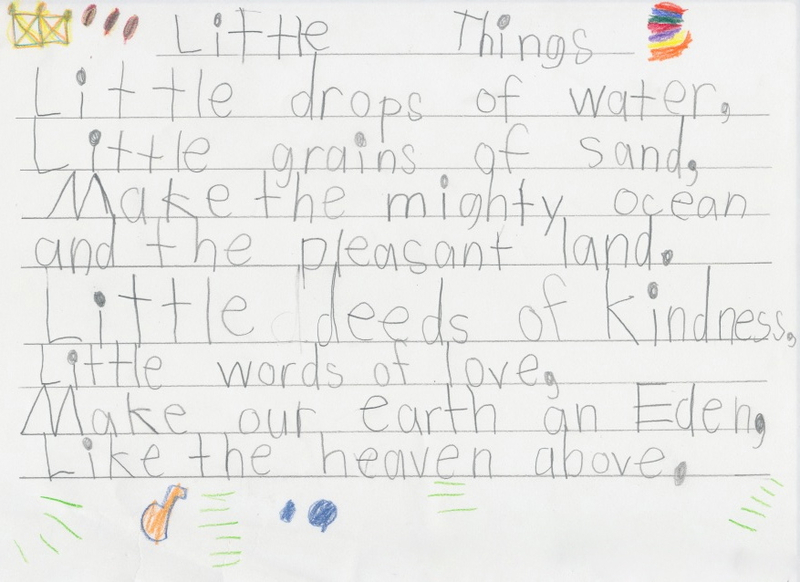 Below is my son’s favorite poem, Little Things by Julia A. F. Carney. The beauty in his five-year-old writing and the sweet joy he gets in reading this poem and knowing he is one of my favorite little things is simply stunning…to me, better than any masterpiece or work of nature I could ever encounter. Wishing you lots of joy in the beauty found in little things today and always! Love is of the soul. I distinctly remember the moment I learned that hate is fear. It’s intriguing. Even if we have never felt hatred, we have all seen it in its various forms. It’s just fear? Yep. And then you go on to figure out that all those other behaviors and emotions that go along with anger, resentment, jealousy, sorrow, spite, judgment, arrogance, even loneliness (it’s a long list)…they all come from fear. Once you connect those dots, it’s no longer just intriguing, it changes everything. First and foremost, when you begin to see what is behind all of those terrible behaviors that come from fear based emotions, you can open your heart with forgiveness immediately to almost anything (truly anything as we get better and better at it…it takes practice). When I deal with these less desirable attitudes and behaviors in people or just things you see around you that stem from them, right before I judge it or react to it, I do my best to remember what it really is. I get a helpful little visual to remind me of what it really is…I picture a scared little child running to its mom for help. Maybe it’s the mom in me, but I think of how awful it feels to be scared and how children instinctively run for mom when something frightens or hurts them. Fear creates all kinds of toxic reactions when really the person just wants to be comforted by love. Next time you are faced with toxic behaviors, remember that person just needs some love. They are having a moment in fear…your love could bring them right out and you have plenty to spare…the more you give, the more you have to give. You will know best how you spread love. You don’t have to tell them you’re providing love for their fear (in fact, don’t do that, they don’t know it’s fear), you can give love simply by not judging them, by being a calm pure loving presence. Practicing forgiveness in this way changes you and opens your heart. Next place to practice it is with yourself. Forgive yourself for your fear based emotions, attitudes and behaviors. When we realize that all that stuff we sometimes think or feel, and even our actions that we are not proud of, all just came out of fear…we can love the scared little child in us too. Give yourself some love and move on. Creating space around our choices and actions will allow us to practice spreading love and forgiving everything else. When you put a breath or just a moment of stillness around your choices, you can choose love. You can picture yourself standing in the middle and you can decide if you want to turn towards love or towards fear. In every single thing you do, you can choose love or fear. Even the thoughts you think, do you want them to be love-based or fear-based? You can even choose the thoughts. Another term for fear that I loved learning about is powerlessness. Whenever you choose fear instead of love, you have chosen powerlessness and given your power away. Your soul wants to live in love and knows that it is the most powerful force in the universe. Your ego chooses fear and creates suffering for you and others. There is no need to explain the behaviors and emotions that come from love, we all have a deep knowing and connectedness with those…they just feel good…your heart delights in them and your soul remembers them well. Today, and always, let’s spread LOVE and forgive fear EVERYWHERE! Have fun experimenting with how you spread love! I am sending YOU so much love! Your Super Power Is Joy! Last night as we were doing the nighttime routine getting the kids ready for bed, one child said something to the other and then came the annoyed frustrated reaction…we know how it goes with little humans (and many big ones too). I bent down to get closer to my sweet six-year-old boy who was pretty agitated. I wanted to ease his suffering. I thought of superheroes. We were in his room, so they were nearby. I said to him “hey buddy, YOU have a super power. Do you know what yours is?” He looked at me with the sweetest surprised expression (still mad, but curious). I told him, “Your super power is joy. You have always had it. From the moment we met you, you have always had the power of joy.” I went on to explain, “Don’t give your power away or let it be taken, it’s your special super power.” I whispered in his ear, “You always choose.” We looked at each other for a moment, then I whispered it in his ear again. He looked at me with understanding and knew what I meant. He took his power back and returned to joy. He has always been good at this. Later I found myself thinking about that little interaction with my dear boy. It had all happened so spontaneously. I was grateful for that moment. Then I realized that I have been getting that message from God through so many of the wonderful teachers and books and so many of Life’s lessons. God has been whispering in my ear, “Your super power is joy.” Love and joy are everywhere and they are accessible to us whenever we can be there. Whenever we lose our joy, we have chosen to give it away. We always choose! As I continue my journey towards really living what I have learned and opening my heart to this amazing universe, I have found myself saying this in my prayers more often lately, “God, thank you so much for how it is all designed, for how amazing it truly is to be here.” I can’t really articulate it in words very well, I just sit in awe and appreciation of the love and joy that is waiting for us in every single moment. YOUR Super Power Is Joy! Use it and spread it today! Sprinkle it Everywhere!